If you drive on northbound I-5 through Olympia, most of the time you likely zip along at freeway speeds. You may not even notice the little "bump...bump" as you drive over the small northbound I-5 bridge at Pacific Avenue. Despite that small cue, the bridge needs a big repair. That repair will take place over two weekends at the end of July, and it will help preserve the highway and avoid more costly repairs down the road. 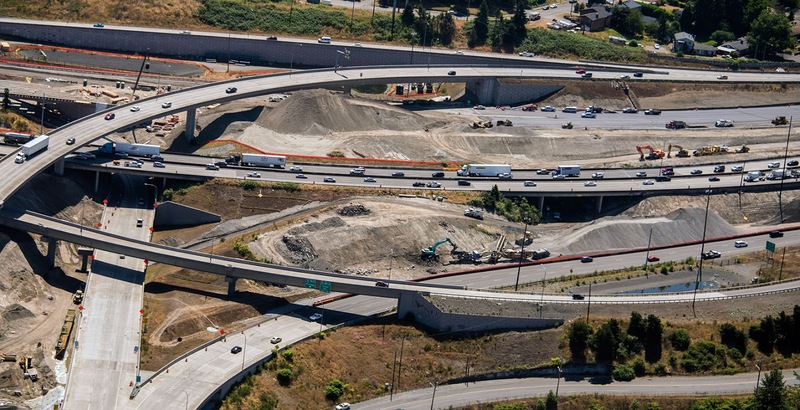 Over the weekends of July 21 and July 28, northbound I-5 will be reduced to two narrowed lanes around the clock, from Friday night to each Monday morning. During the daytime significant backups are expected. Contractor crews will repair two key elements of the bridge's infrastructure. Workers need to rebuild what is called a bridge approach slab. The slab is a piece of concrete that connects the northbound lanes with the bridge over Pacific Avenue. This approach slab continues to bow as material under the highway surface settles. In this project, the existing slab will be demolished and removed. Crews will then shore up the material under the highway and replace the roadway surface. The second effort will be to replace a bridge expansion joint. The joint allows the bridge to move and flex with changing traffic and weather conditions. Here is the bridge expansion joint that needs regular repairs. Workers will replace half of the joint and approach slab during the first weekend. Crews will finish the second half during the second weekend. Why can't you do this work at night and during the fall/winter? In western Washington, Mother Nature dictates when this and other types of highway construction can occur. We need mostly dry and warm weather in order for the concrete to set well. We are very likely to get poor weather during fall, winter and even early spring. As for why this work can't be done during overnight hours, once crews start they must continue until it's complete. There will be times when there is no roadway to use. This kind of work also requires concrete curing time. The new roadway surface needs to harden before vehicles can drive on it, which means there may be times when drivers see closed lanes with no crews on site. It means working through the entire weekend. We are concerned this work will create miles-long backups and we need your help. We're asking all northbound I-5 drivers through Olympia to plan ahead. Make sure your gas tank is full before heading out. Please drive carefully. Collisions within the backups would exacerbate the situation. We will have additional Incident Response Teams pre-positioned in the work zone to clear any collisions that might occur. The Washington State Patrol will also be on scene to keep an eye on things. Before heading out, check Olympia-area traffic conditions and cameras. Mountain passes: stop and go, stop and go, what gives? As construction projects freckle Puget Sound roadways in the lowlands, travelers headed across the mountain passes have roadwork to navigate through as well. East-west trips across the state are proving to be slow this summer as our contractor crews take advantage of the warm and dry weather to repair more than one hundred miles of highway. Why can’t WSDOT plan just one project at a time? The paving window in the Pacific Northwest is about three months in the lowlands, but only two months for cooler locations like the mountain pass areas. The materials used to protect the pavement need summertime conditions to ensure the products used stick to the road. That means July and August are very popular months to pave. The short weather window translates to an all hands on deck situation. Get in with as many crews as possible, and get out before the weather turns cool and wet again. For travelers, that might mean hitting several different sections of roadwork as you travel east or west across the state. We have a lot of work to do on our mountain pass highways to keep them safe for travelers. We do our best to schedule the roadwork far in advance in order to coordinate and minimize the effect on travelers. However, our mountain pass highways are in need of some TLC due to the harsh winter weather they experience. Why am I waiting so long? To get the big picture on why you’re waiting so long, let’s map out the projects on our mountain passes. Weekday drivers on US 2 between Gold Bar and Skykomish are experiencing delays of more than an hour as they travel through several sections of pavement preservation work. Because US 2 is a two-lane highway, a pilot car guides alternating traffic through each work zone. Weekday and weekend drivers on Interstate 90 between North Bend and Ellensburg know the meaning of delays as bridge deck and pavement repair work continues. Weekend delays over Snoqualmie Pass have been upwards of 90 minutes and will most likely continue until the end of summer. 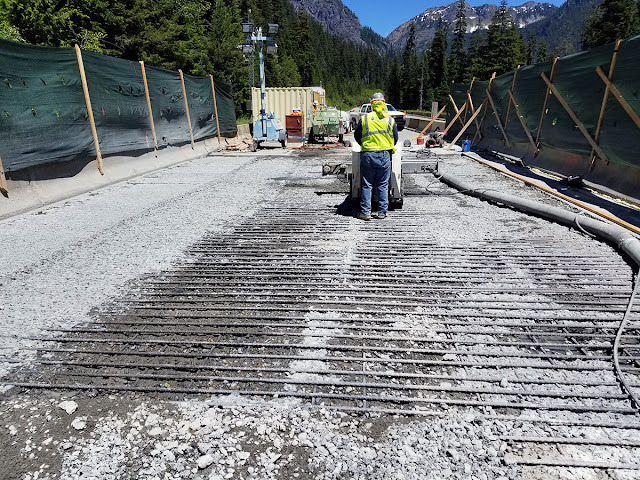 Several sections of US 12 between Packwood and Rimrock Lake will be repaved, which will cause double-digit delays as people travel through multiple construction zones. State Route 20 up north is also under the knife with daytime lane closures. Weekday delays up to 30 minutes are expected on SR 410 between Chinook Pass (milepost 69) and Naches (milepost 116 beginning Monday, starting July 24. If you’re hitting the road this summer, try to set yourself up for success. Make sure your vehicle is in good shape and you have extra snacks, books and good tunes for people riding along. Once the leaves begin to fall this autumn, the smoother ride will be welcome change and hold up to the harsh winter weather for years to come. 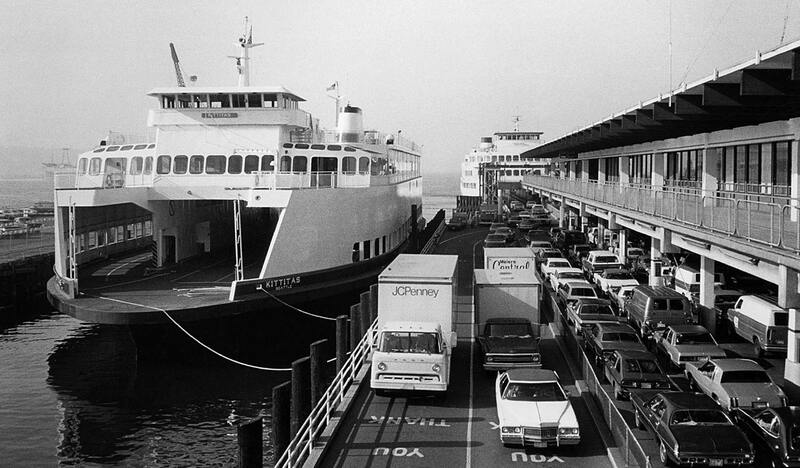 The Kittitas has been sailing around the Sound since 1980. For Washington state’s active 22-ferry fleet, the average age of our boats is just shy of 30 years old. Thirteen ferries are over the age of 30. Of those, five are at least 50 years old. 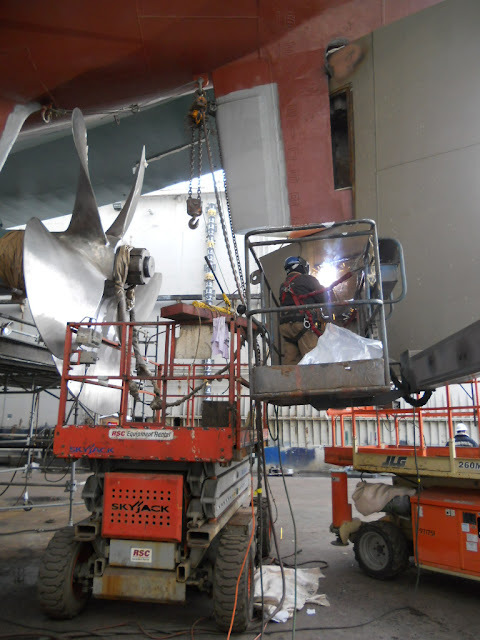 Our maintenance crews do a masterful job of keeping all the vessels in shape to serve for up to six decades. However, just like a car, the older and more miles (the average ferry runs about 20 hours a day! ), the more maintenance and sudden repairs it can require. Occasionally, a fix calls for a part that is no longer available and a replacement has to be custom built. 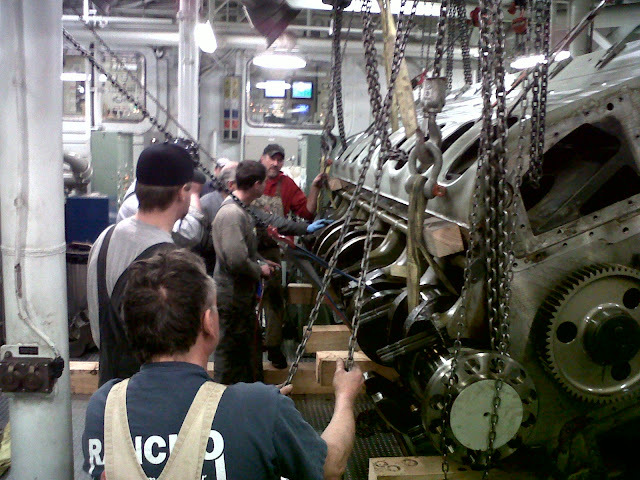 The Tacoma gets an engine inspection and maintenance. Vessels are pulled from service once a year for routine inspections, mandated by the United States Coast Guard, to help keep them safe. 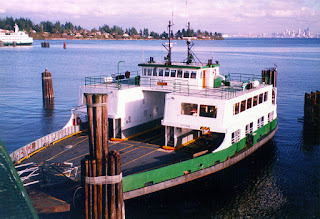 Sometimes a ferry breakdown leaves a route with one less boat, which can cause wait times to inch past the three-hour mark as drivers wait their turn to board. Cancelled trips make up a fraction of the approximate tens of thousands of trips made every year. Less than 1 percent! However, that doesn’t make it any less of an inconvenience when it’s your route that has canceled sailings due to a boat breakdown, a medical emergency or unforeseen events. propellers, rudders and underwater appendages. Why not use a backup boat? Many transit agencies have two backup vessels for every dozen in their fleet. Washington State Ferries fleet planners make one spare vessel available for relief use throughout the year, but unscheduled repairs can quickly consume this extra capacity. In fact, at the time of this blog post, our entire fleet is either in service or in the shop – there is no relief boat available to fill in. It’d be akin to blowing out a tire on a car, replacing it with the lone donut and then blowing out another tire. In short, if another ferry breaks down this summer, we would be out of spares. was replaced by the “younger” Hyak. The Hyak is 50 years old. Due to safety rules that address the number of hours a crew can work, a new crew often must be brought in. Public notice: Notifications must be sent out to the route that’s losing a boat to let riders know that their route will have fewer sailings or less car capacity. Boats can’t teleport: It can take a ferry three to six hours to sail from one route to another. Why don’t you build more boats? The Chimacum is the newest boat in the fleet and went into service on the Seattle/Bremerton route this year. We are! It takes about four to six years to design and build a new ferry. Our newest boat cost $123 million. Buying used boats and throwing the iconic green and white paint on isn’t an option either. Our ferries are built to fit in our terminals and are designed to navigate in Puget Sound’s unique environment. Our crews work like mad to diagnose the issue and fix it as soon as possible. To stay in the know, ferry riders can plug in – follow our Twitter account and sign up for email updates to help make informed decisions. We suggest customers use our online tools such as Vessel Watch and Travel Alert Bulletins even if they take the ferry every day of the week, because things can and do change. Last, but not least, the best way to avoid long lineups at the terminal – due to boat breakdowns or heavy traffic – is to leave the car at home and ride the bus, vanpool with friends or co-workers, take a bicycle out for a spin or walk on instead. There’s rarely a wait for human-powered ferry riders! This is it! 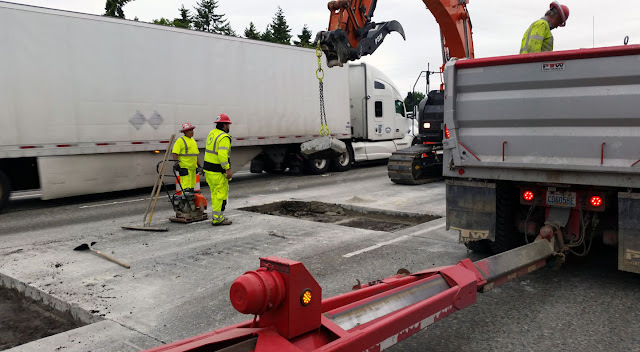 Everything is in place for Monday, July 17, when we’ll open our newly aligned, SR 520 westbound off-ramps to Montlake and Lake Washington Boulevards! For more than 50 years, westbound SR 520 drivers have driven across Lake Washington and exited into Montlake near the Lake Washington shoreline. Monday morning, July 17, will be a new day and a new way for drivers heading west. When the new off-ramps open, not only will it be the first time drivers will travel on the new bridge structure, but they will also enter a new exit lane which starts near the west end of the floating bridge - a mile earlier than they have for the past five decades. This video illustrates how much earlier drivers need to exit to get to the Montlake neighborhood. Here’s the bottom line: We don’t want you to miss your exit. Westbound drivers planning to exit should stay in the right lane while on the floating bridge to access the off-ramps. If you miss your exit, you’ll need to exit at Roanoke or I-5. We’ll open all construction areas to traffic by the end of the year. Here’s the order (pdf 1 mb). Phase 1: New exit lane and off-ramps to Montlake and Lake Washington boulevards open (Monday, July 17). Phase 2: Open westbound general-purpose and HOV lanes from the floating bridge to Montlake (August, 2017). You’ll need to get your bike and running shoes ready for the final phase. We’d love to interact with you more. The first @WSDOT_520 follower on Twitter that mentions this blog will win a free SR 520 Grand Opening hat. Good luck! You know the drill! Summer and road construction go hand in hand here in the Pacific Northwest and that's definitely true in Clark County. Our larger paving jobs are done during the summer months because we need hot, dry weather to get a roadway surface built to last. There are going to be times when getting where you want to go will be a bit of a challenge, but a little planning can go a long way in helping you get around. Beginning in mid-July, we'll start work on three highway resurfacing projects to repair damaged pavement. Doing the work now keeps our highway system running smoothly, reducing the need for costly emergency repairs and unexpected highway closures in the future. Remember the eight-mile backup on southbound Interstate 5 near Kalama earlier this year? 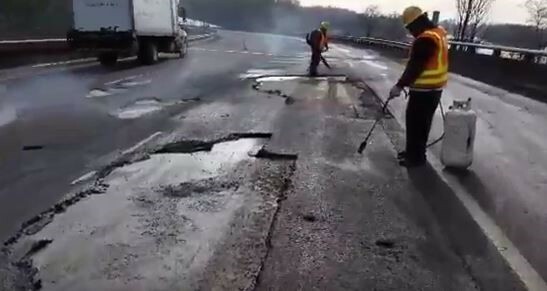 Two lanes of the highway were closed while crews made emergency repairs after the pavement separated from the road following an unusually cold, wet winter. Well, our work this summer will help reduce the chances of similar situations happening in the future. 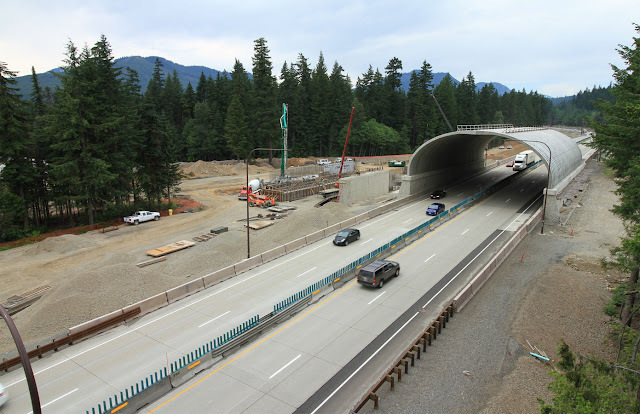 This summer, the stretch of southbound I-5 near Kalama where the emergency work took place and the southbound I-5 North Fork Lewis River Bridge near Woodland are getting facelifts. Crews will resurface the bridge decks, replace expansion joints, install new waterproof membranes (adding protection to the infrastructure of the road) and apply new pavement markings. During construction, scheduled to begin on Monday, July 24, you'll encounter daytime single-lane closures and overnight double-lane closures through the work zones. For everyone's safety, the speed limit will be reduced to 60 mph in the area until the work is completed this fall. Please be sure to slow down and give crews room to work. 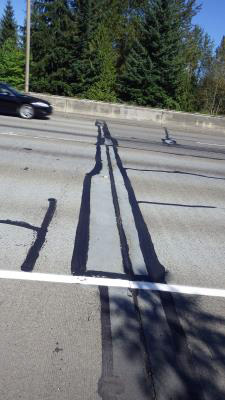 Heavy traffic and harsh weather have created cracks, ruts and potholes on Padden Parkway between 117th Avenue and NE 162nd Avenue, and along NE 162nd Avenue to NE Fourth Plain Boulevard north of Vancouver. This area hasn't been paved since it was built in 2000 so we're reviving the road this summer. More than 30,000 vehicles use this stretch of highway every day, so we work to keep disruptions to a minimum. 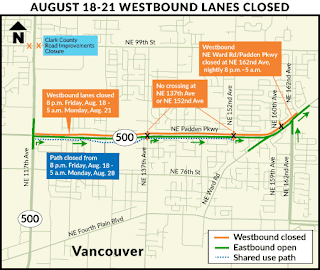 Westbound lanes will close Friday, Aug. 18 to the morning of Monday, Aug. 21: The westbound lanes of Padden Parkway between Northeast 162nd Avenue and Northeast 117th Avenue will close from 8 p.m. Friday, Aug. 18, until 5 a.m. Monday, Aug.21. 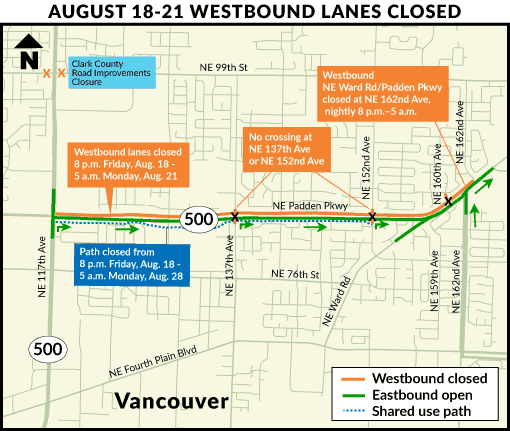 Due to the closures, north and southbound traffic will not be permitted to cross Padden Parkway between Northeast 162nd Avenue and Northeast 117th Avenue. Friday, Aug. 18, Saturday, Aug. 19 and Sunday, Aug. 20: Drivers on westbound Northeast Ward Road will not be able to turn left onto Northeast 162th Avenue from 8 p.m. until 5 a.m. 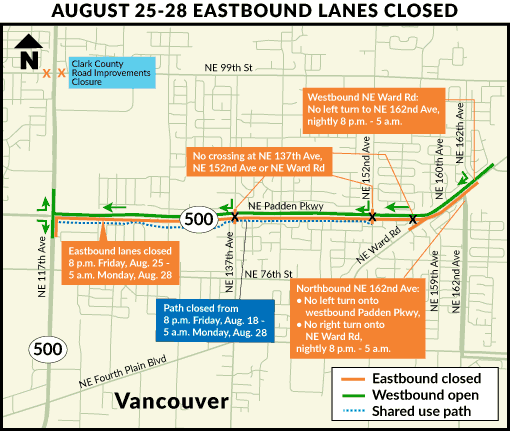 Eastbound lanes will close Friday, Aug. 25 to the morning of Monday, Aug. 28: The eastbound lanes of Padden Parkway between Northeast 117th Avenue and Northeast 162nd Avenue will close from 8 p.m. Friday, Aug. 25 until 5 a.m. Monday, Aug. 28. Due to the closures, north and southbound traffic will not be permitted to cross Padden Parkway between Northeast 162nd Avenue and Northeast 117th Avenue. 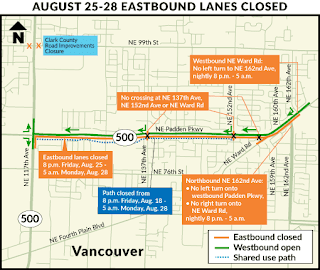 Friday, Aug. 25, Saturday, Aug. 26 and Sunday, Aug. 27: Drivers on northbound Northeast 162th Avenue will not be able to turn right onto Northeast Ward Road or turn left onto westbound Padden Parkway from 8 p.m. until 5 a.m.Daytime and overnight lane closures on both directions of the highway will be in place for resurfacing work starting in mid-July through the fall. During the closures, people should plan to use alternate routes and expect delays. The work is weather dependent and may be rescheduled due to rain. The popular shared use path on the south side of Padden Parkway in this location will close from 8 p.m. Friday, Aug. 18 until 5 a.m. Monday, Aug. 28 while new ADA ramps are installed. Note: Northeast 99th Street is closed at Northeast 117th Avenue for a Clark County Public Works roadway improvement project. Sections of SR 501 – also known as NW Lower River Road – in Vancouver are cracked and rutted. Beginning on Friday, July 14, crews will resurface the road by applying a hot layer of rocks and asphalt on top of the roadway surface, which protects the roadbed from things like water and ice. If you drive or bike this stretch of roadway, you'll alternate through a single lane of the highway daily during daytime hours. There will be loose gravel on the roadway. As with any highway construction project, use caution in the work zone. The speed limit through the area will be temporarily reduced from 55 mph to 35 mph. Sign up to receive email updates about all of these projects. Check your route before heading out the door on our mobile app or our construction web page. Research if there are other routes you might take to avoid construction. If you decide to travel on roads and highways under construction, give yourself extra time. Work on these projects is weather dependent and can be delayed due to rain. Be sure to check with the City of Vancouver and Clark County for updates on other Clark County area road construction. While getting through construction can take a little more time than we're used to, once the work is complete, it's easy to enjoy the long-term benefits of a smooth ride. "Why do you close all those lanes when you're not working?" We've been asked this specific question quite a lot when it comes to our #ReviveI5 project on northbound I-5 in Kent, SeaTac and Tukwila. While you may not see equipment or workers in a specific area, we want to reassure you that work is happening. Paving asphalt is a slow operation and we require a safe work zone for our crews. While we pave, a lot of the work zone has nothing happening. It takes several hours to pave a single lane four miles long. Then we need to go back and start over again on the next lane. During a weekend lane closure, we usually pave multiple layers. So while we pave, you'll see a lot of work zone where nothing is happening, but it's safer to keep the whole zone closed. We need people to take out concrete, but while the new concrete is curing, they can leave. Occasionally when "nothing is happening," we are letting concrete harden. In many places we need to remove old, broken concrete panels and pour new ones. Concrete doesn't need supervision to harden, so you won't see workers. Our first consideration is always safety – for drivers, for our contractors, for our staff. On all projects, we need open space between where crews are working and traffic. The higher the speed of the traffic, the more room we need so crews have time to react if something happens. created by putting out traffic barrels. For #ReviveI5, much of the work is paving, which is a moving operation. 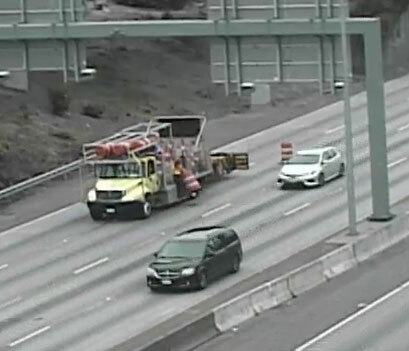 Crews set orange barrels to designate the work zone. It's challenging work – they are placing barrels within feet of moving vehicles – and it takes a couple of hours. It's sensible to set up the entire work zone and leave it in place. Continually moving the barriers as the paving operation moves would be hazardous. Besides, a constantly changing work zone would only add confusion and make traffic worse. There are occasions we may have to stop work for weather. However, if we plan to restart once the weather improves, reopening – then reclosing – lanes takes too long to be worthwhile. We want to finish the work and open all lanes as soon as safely possible, so you can enjoy the open road. We have three more weekends scheduled for paving – July 7-10, 14-17 and Aug. 11-14. We'll be working, even if it isn't always obvious. You’ve already heard about the construction taking place across I-90 between North Bend and Ellensburg this summer. You’ve watched our videos, read our blogs, followed us on Twitter and Facebook and even downloaded our app to prepare you for your trip. You know no matter what day, time or weekend you travel across I-90, you’re going to be slowed down this summer. So this isn’t another blog about how you need to “know before you go” or “pack your patience,” because you already know that. Instead, we want to fill you in on the progress we’ve made in the four major construction zones between North Bend and Ellensburg. Crews set girders on the new westbound I-90 avalanche bridge over Snoqualmie Pass. 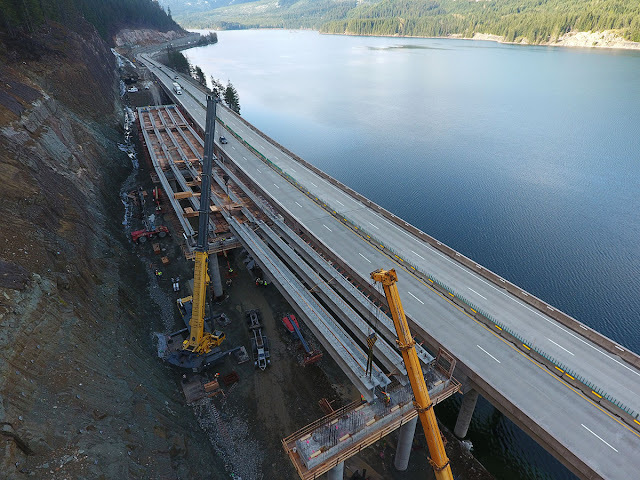 Over the past nine weeks, contractor crews have resurfaced three deteriorating bridge decks, laid 50,000 tons of asphalt, poured more than 21,000 cubic yards of concrete, replaced 25 broken concrete panels, set 43 girders and poured concrete for two deck spans for the new westbound avalanche bridge. 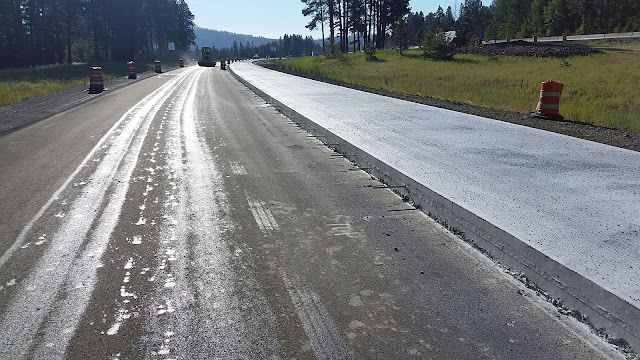 Westbound I-90 through Cle Elum is getting new pavement. In order to do this work, we have to keep traffic off the areas we are working, which is the reason you are driving through shifted lanes and detours. These detours and traffic shifts need to remain in place 24 hours a day, 7 days a week until the work is finished because we can’t put you on torn up roadway and bridge decks. Several bridge decks are being repaired across I-90 and traffic must stay off the roadway while it is torn up. Before our contractor crews can call it quits for the summer, they still need to replace more than 460 concrete panels, repave six miles of existing roadway, build seven miles of new roadway, repair five more bridge decks, finish the westbound avalanche bridge and install the arches for the new eastbound wildlife overcrossing. 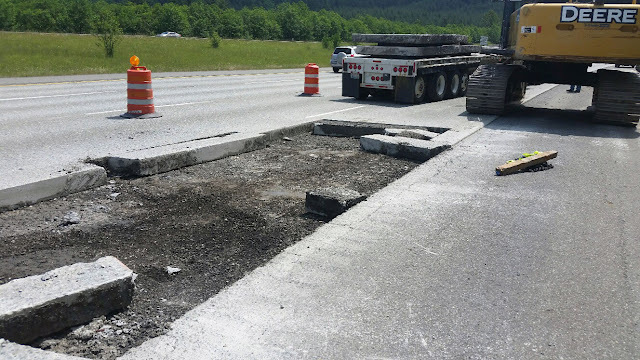 Work on I-90 this summer includes replacing 480 concrete panels. Phew, that’s a lot of work! So needless to say, it’s probably still a good idea to remind you to continue to watch our videos, read our blogs, follow us on Twitter and Facebook, check our app, and visit our What’s Happening on I-90 webpage to help you “know before you go” so you can “pack your patience” this summer. constructed next to the existing arches in the eastbound lanes. We know it’s frustrating sitting in traffic, especially on beautiful, sunny summer days. We hope that at least having a sense of the progress being made to improve this major corridor will help take some of the sting out of it, and we appreciate your patience.